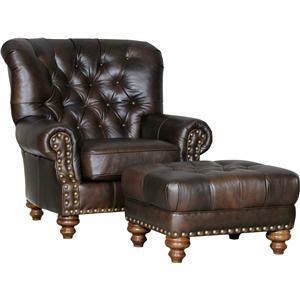 This living room chair and ottoman set will make the perfect place for you to sit and read after a long, busy day. This piece features plush cushions with a matching toss pillow that offers a pop of color. The coordinating ottoman allows you to place your feet up. The 2600 Chair and Ottoman by Mayo at Olinde's Furniture in the Baton Rouge and Lafayette, Louisiana area. Product availability may vary. Contact us for the most current availability on this product. Casual comfort. Traditional charm. A room for the family. This collection will provide you with all the charm you seek in your living room collection. Items in this furniture group feature traditional rounded arms and soft cushions mixed with cottage style skirts. The 2600 collection is a great option if you are looking for Cottage furniture in the Baton Rouge and Lafayette, Louisiana area. Browse other items in the 2600 collection from Olinde's Furniture in the Baton Rouge and Lafayette, Louisiana area.